Looking at Exchange 2016, what does this CU bring us? 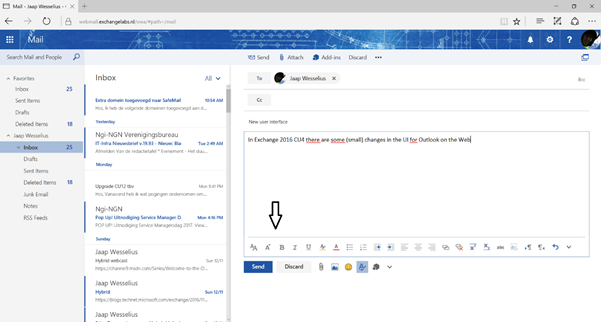 There are minor changes to the user interface of Outlook on the Web or Outlook Web App, whatever you may call it. It’s not that dramatically, the formatting controls have been moved to the bottom of the frame containing the editing pane, as can be seen on the following screenshot. And finally, there’s support for the .NET Framework 4.6.2. Using .NET Framework 4.6.2 is still optional (but recommended), but the upcoming release in March 2017 (Exchange 2016 CU5) will require the use of .NET Framework 4.6.2. As you might have noticed, Exchange 2016 CU3 (the previous release) introduced support for Windows Server 2016. This was also announced at the Ignite 2016 in Atlanta. Unfortunately there was a major flaw in Windows 2016 clustering that caused issues with Exchange 2016 in a Database Availability Group configuration. This has now been fixed by the Windows team (KB3206632), and Exchange 2016 again fully supports Windows 2016. The hotfix is mentioned is mandatory, and the setup application does a check for this hotfix. Exchange 2016 does not introduce any new schema changes, but you may execute setup.exe /prepareAD /IAcceptExchangeServerLicenseTerms to make sure any changes in the configuration partition are applied successfully. As usual, and especially after the latest issues with Exchange 2016 CU3 and Windows 2016 I strongly encourage everybody to thoroughly test Exchange 2016 CU4 (or any other update that’s needed of course) in your lab environment before bringing it into production! Fully functional, single Exchange 2013 SP1 (CU4) with Microsoft .NET 4.6.1 without KB3146715 HotFix. Should I upgrade to CU15, install KB3146715 hotfix right after installing CU15, and reboot? Or install KB3146715 hotfix first, reboot, CU15?